I have recently purchased two items that are diminutive in stature...petite, if you will. And they are darling. I happen to work across the street from a bananas-awesome consignment shop. This place is PACKED with goodies and it is my favorite spot to spend a lunch break. 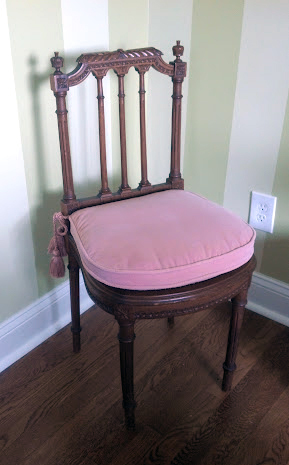 During my last visit, I encountered this sweet little chair. 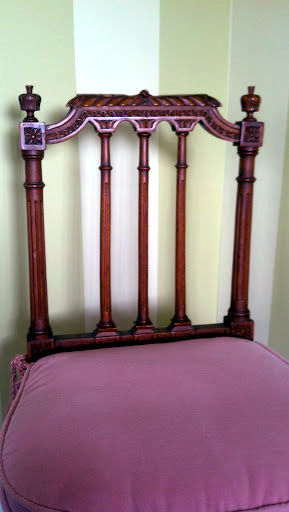 Its beautiful detailing and tassled-velvet pink chair pad pulled at my heart strings. Side note for furniture buffs, what would the style/decoration of this chair be classified as? 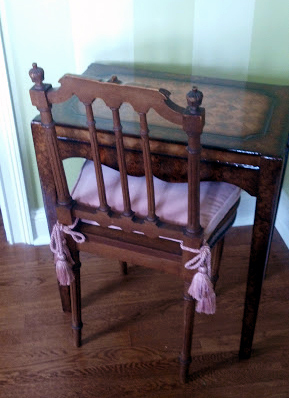 This beautiful little chair was $75 and I couldn't walk away....nowhere to put it, but I couldn't walk away. I'm thinking of using it as a decorative chair in my new office, under one of the windows. 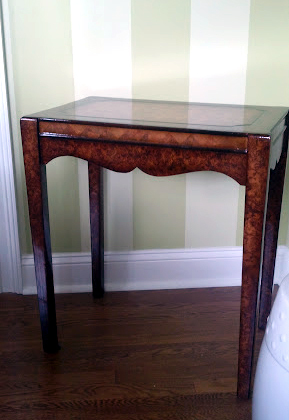 A couple of days later during a trip to HomeGoods, I found a gorgeous little faux-burlwood table. And for $50, I also couldn't pass it up. Again, nowhere to put it, but it's quite small so I should be able to squeeze it in somewhere. I just loved the finish on it and it's an inexpensive little piece that I can move around the house. No way any full-grown human can actually fit at this desk, but it's super-cute to look at. Too cute and great chair! Love the detail!! LOVE THE CHAIR! I would have snapped it up IMMEDIATELY, too!! !